...and the media dropped the ball. 1. 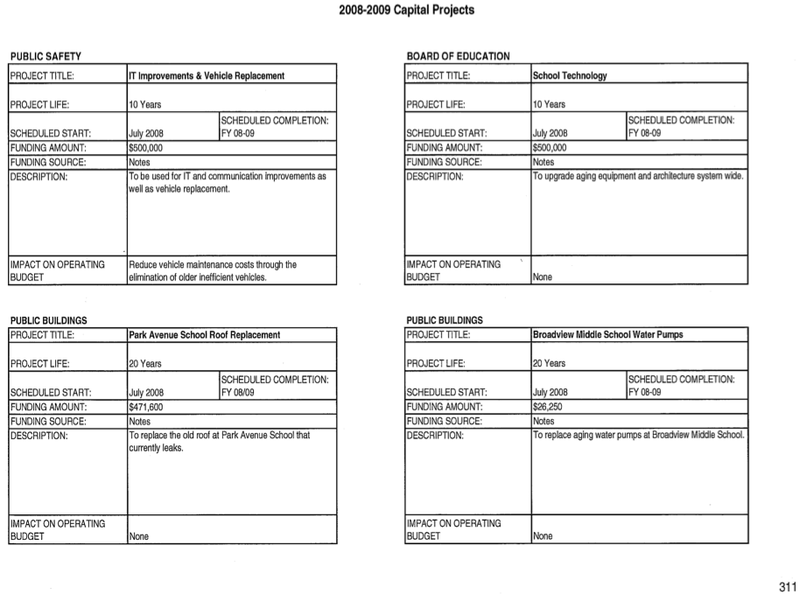 Here's page 299-300 of the city's proposed 2008-09 budget that pertains to the Capital Budget (the part that has the five 500,000 dollar bonds that the mayor is adding to our tax burden without our approval). Note the section highlighted in red. 2. From yesterday's Common Council meeting, listen to Lynn Taborsak as she attempts to talk about the out-of-control bonding habits of this mayor (NOTE: Why wasn't Taborsak allowed to speak about an item that's on page 305 of the very budget that's being approved? She point had nothing to do with the bonds but on the item on page 305). (For the record, here's page 305 of the budget Taborsak was referring to...read it and weep). 3. In the video, did you catch Boughton say that the portion of the budget Taborsak was referring to (a portion of items within the Capital Budget) wasn't coming up for a vote until JUNE. 3. If the items (bonds) are not voted on by May 15, then (if my interpretation of the charter is correct) aren't the bonds automatically approved in the next business day? 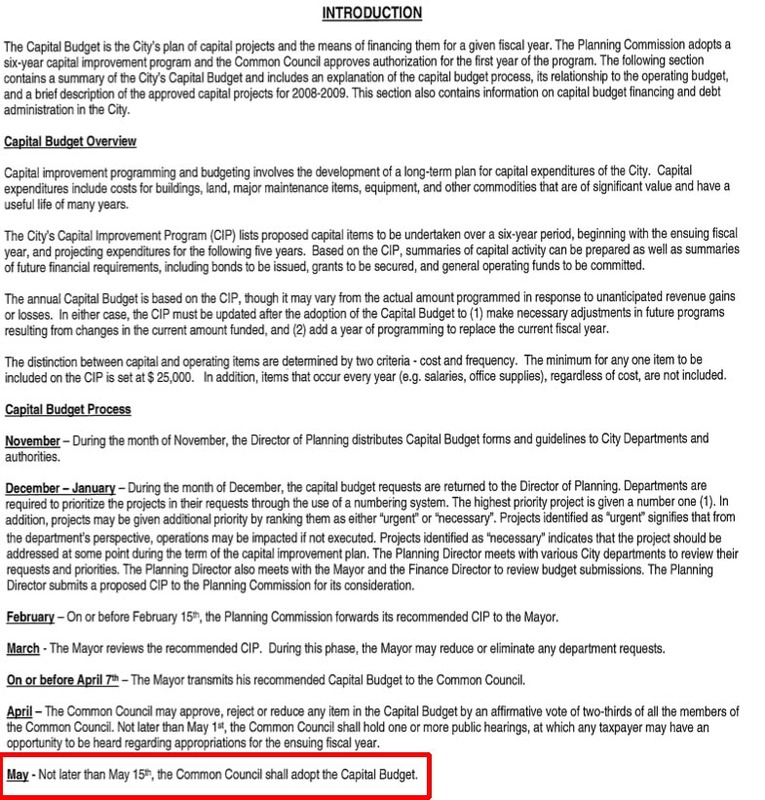 Again, we're talking a portion of the Capitol Budget which is part of the entire budget, which, according to the charter, needs to be voted on my the 15th of May by the council OR ELSE the budget that the mayor presented (back in April) is automatically approved (per sec 7-4 of the charter). In honor of those who are up in arms over this year's ridiculous budget, take a moment and listen to what Lynn Taborsak said last year about the mayor's spending habits. While watching the video, take note of the items she brings up and the amount of money each item costs the taxpayers (i.e., Charles Ives Center, seven year BRT tax break, politics of the grant agencies budget). In a later post, I'll show you how her warnings from LAST year came true THIS year. CNN has just reported that 100,000 people have died in Burma from the cyclone that hit the area. To put this level of destruction into perspective, Danbury's total population as estimated at 85,000. With the level of death and destruction, the situation in Burman is not going to get better any time soon and they desperately need help. Now, the government has slowed the urgent process of providing humanitarian relief--so Avaaz is raising funds for the International Burmese Monks Organization and related groups, which will transmit funds directly to monasteries in affected areas. ....is working out just fine. As you know, when it comes to campaigns, it's all about the money. 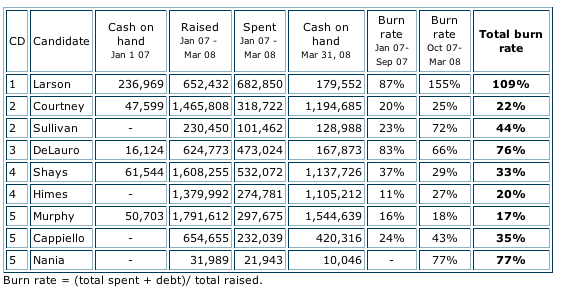 While it's interesting to look at campaign fundraising. it's equally as important to monitor spending habits (a.k.a burn rate). Over at My Left Nutmeg, MikleCT did an burn rate report has analysis of the 4 and 5 Congressional races is rather interesting. Chris Shays has decreased his burn rate over the last few months, not because he has decreased his spending, but because he has raised more money. Fundraising consultants are the leading beneficiaries of his largesse, sucking up $50,350 of his funds in the last half year. Perhaps Shays has been feeling a little lonely as the sole House Republican in New England. He gave $1,000 late last year to Jeb Bradley, who is trying to retake the New Hampshire seat he lost in a 2006 upset to Carol Shea-Porter. He contributed to the unsuccessful Massachusetts special election campaign of Jim Oganowski, who tried to take the seat vacated by Marty Meehan, and sent $1,000 to David Cappiello. On his donor list elsewhere in the nation were John Gard and Bob Latta, who sport strongly anti-choice records. For most quarters last year, Himes raised more funds and spent much less than Shays, closing the gap in their cash on hand. His burn rate remains lower than Shays' overall. But in the first quarter of this year, for the first time, Himes both raised less and spent more than Shays. Some of this increase in spending is accounted for by increased staffing, rent, and other expenses that he had not incurred in his start-up phase. He has, however, substantially increased his use of consultants, including $28,218 to the Feldman Group, a DC-based polling firm; $9,000 to Stamford-based Carlisle Hill LLC for "campaign management consulting services;" $5,000 to Paul Hortenstine, legislative assistant to Senator Bernie Sanders, for "research consulting services"; and $5,000 to Blue State Digital for Web site design. Unlike most campaigns, Himes remained blissfully free of fundraising consultants during this period, which could help explain his success in raising funds. Chris Murphy has become the most efficient candidate in the state, with the lowest burn rate. While the spending of most candidates can swing widely from quarter to quarter, Murphy's disciplined campaign engine keeps humming at similar dollar spending levels - about $61K to $67K over the last three quarters. Even at the end of June in the 2006 cycle, he had spent only 15% of his funds; he has thus far spent 17% in this cycle. He is spending at half the burn rate of Cappiello, whom I suspect has little name recognition to show for his money. $250 for a bartender and $420 for wine to drown his troubles. spent $970 for a Web site that... doesn't seem to exist. The April 2008 pre-convention finance reports have been released. The three weeks of time on which they report is too brief a period to fairly evaluate burn rates, so their data were not incorporated into the analysis above. While there is certainly time in this quarter for increased fundraising and the April report is a mid-course snapshot, it is clear that the Himes campaign is accelerating, rather than scaling back their spending. Himes spent nearly three times as much as the nearest candidate in April. In just the first three weeks of this quarter, he has spent 80% of what he expended in the entire first quarter of 2008. The vast majority ($74,686) went to consultants, including $33,252 to a polling firm, $23,170 to a media and advertising firm, and $6,000 for his first fundraising consultant. ...Tony Nania is left with less than $6,000 to his name as the May 10 GOP nominating convention approaches. The income from David Cappiello's Bush/Kissinger fundraiser was not reflected in the pre-convention report. Despite the de facto taxpayer subsidy for the event, the expenses charged for the fundraiser are likely to be substantial. A change in the way the city borrows, or are residents getting the short end of the stick? First, let me apologize for not going over the budget in detail. I'm in the middle of a rather large project and I didn't have time to post every video of the budget ad-hoc committee meetings and point out numerous problems with the budget that's going to hit us all in the pocketbook BIGTIME. But I have just enough time to go into one subject that's really driving me nuts...the NEW way Mayor Boughton is proposing bonds to the city. Now, this is going to be a bit of a learning experience for some as it will involve knowing a bit about the city charter (which is considered to be the constitution of the city) as well as the history of the bonding council and corporation council. This is section 7-10a of the city charter (which was modified in 1991). Pay particular attention to the portion in BOLD. a. The Common Council shall have power to authorize indebtedness by issuing bonds or notes as provided by the General Statutes subject to the limitations thereof and the provisions of this Section. The issuance of bonds and notes shall be authorized by ordinance adopted by the Common Council with the affirmative vote of at least two-thirds ( 2/3) of the entire membership of the Council. No bond shall be issued for a term longer than the estimated life of the improvement for which they are issued and in no event for a term longer than twenty years. Whenever the Common Council votes to issue bonds or notes in a principal amount in excess of $500,000.00, the ordinance authorizing such issues shall be submitted for approval or disapproval of the electors at the next municipal election or at a special City meeting called by the Mayor and warned for the specific purpose of voting on the question of such issue on the voting machines in the several voting districts. In other words, whenever the Common Council votes to issue BONDS or NOTES in a PRINCIPAL AMOUNT in excess of 500,000 dollars, the matter goes to the people for an up or down vote. According to Mayor Gene Eriquez's when he was mayor (1989-2001), in the 90s, Corporation Council and Robinson and Cole (bond council) offered an legal opinion that mirrors what the charter states. Basically, when you hit the 500,000 PRINCIPAL AMOUNT mark in bonds, you HAVE to go to the voters for approval (this is commonly known as a referendum). This means that Once your bonds goes over the 500,000 PRINCIPAL AMOUNT limit (regardless if it's one or several bonds), you go to the voters for approval. 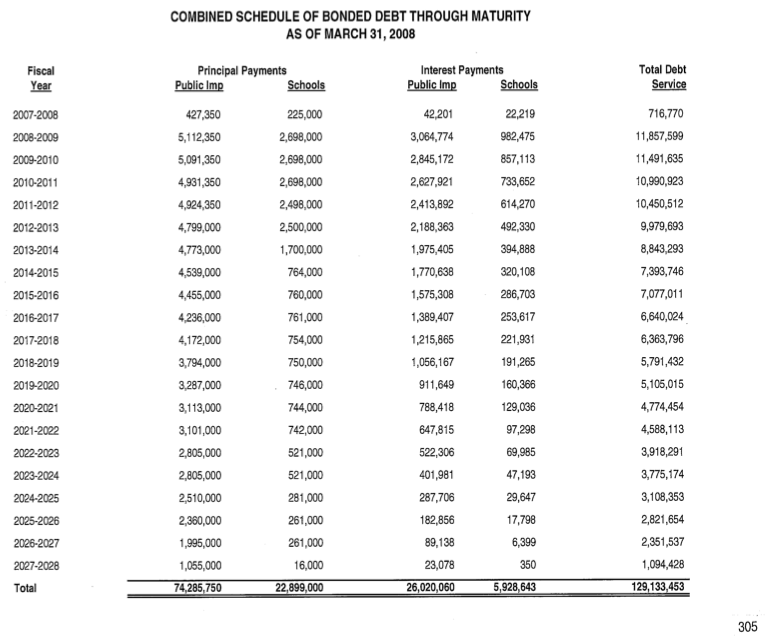 Put it like this, if Eriquez issued 11 50,000 bonds at once in a fiscal year, the principal amount would be 11 x 50,000 dollars or 555,000 dollars and would trigger a referendum. Now, the city charter hasn't changed since 1991, the bond council hasn't changed since 1991 (Robinson and Cole) and Corporation Council hasn't changed YET in March of '08 SOMEHOW the legal opinion of Robinson and Cole (bond council that makes a LOT of money from the city) changed and somehow Boughton is able to do something that NO OTHER MAYOR PRIOR TO HIS ADMINISTRATION has ever done before. NOW, as long as you keep your bond project under the 500,000 limit, you NEVER need to get the people's opinion...NEVER. Basically, the whole idea of a referendum is now thrown out the window as long as you can keep your capital improvement bond projects under 500,000. Under this scenario, unlike previous mayors, and using the model I used for Eriquez, Boughton CAN issued 11 50,000 bonds in a fiscal year, where the principal amount would be 11 x 50,000 dollars or 555,000 dollars and there would be no need for a referendum. 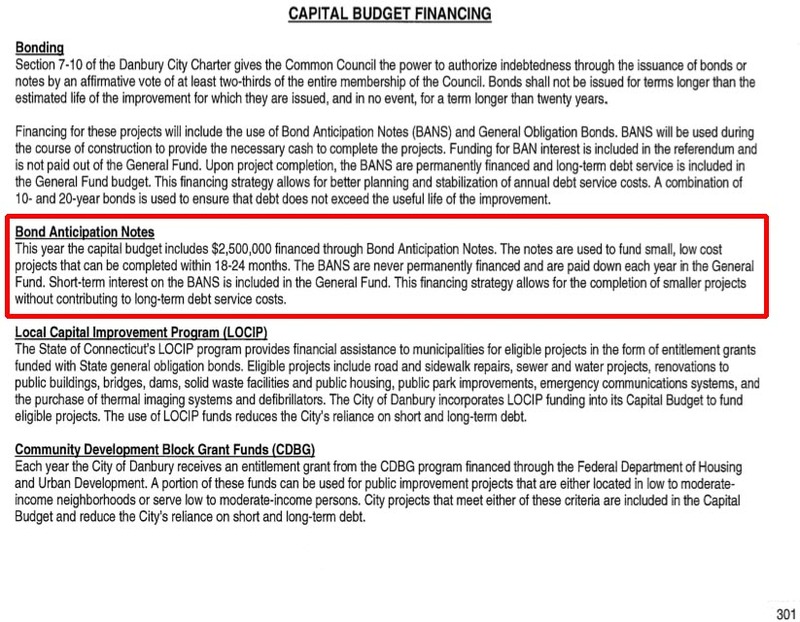 Well, scratch that 555,000 example out of your mind, because Boughton is now presenting 5 bonds at once that are totaling 2.5 MILLION dollars without the people of Danbury having their say. The mayor's proposed 2008-09 spending plan features a major shift in the city's borrowing policy. Traditionally, when city officials wanted to borrow more than $500,000 in a year, the issue was put out to voters for approval. However, the mayor's budget calls for borrowing about $2.5 million for five projects, each one costing roughly $500,000. Those projects are separate and do not require voter approval, a fact that has rankled some residents. Rankled is an understatement. As I stated before, I would have talked about this earlier but I'm so busy in a project that I don't have the time to give this topic proper justice but other residents are picking up the slack and sounding the alarm bells. 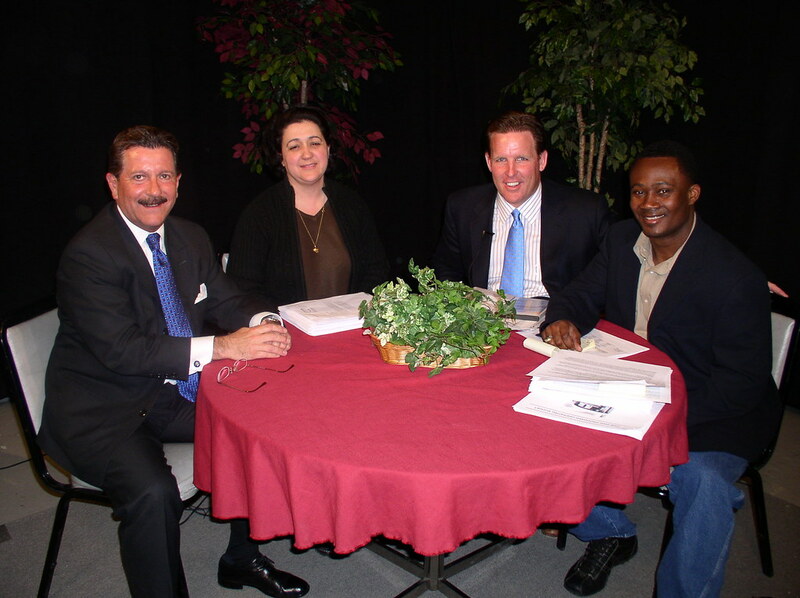 "That is not how our local government has been run for the last 35 years," said Lynn Waller, a Danbury resident and host of a cable access show focusing on city issues. "It is a major policy shift. There is no doubt about it," Mayor Mark Boughton said. In other words, Boughton knows what he's doing is going against something that has NEVER been done before in the history of the city. • The current Corporation Council is the SAME council under Eriquez's watch. • The bond council (Robinson and Cole) is the SAME council as during Eriquez's watch that stated to him (in a written legal opinion in the 90s) that he (Eriquez) can not do what Boughton is currently proposing to do in terms of issuing individual where the principal amount exceeds 500,000 without going to the people for approval. • The city charter section 7-10a that pertains to bonding (and CLEARLY states the legal opinion that Robinson and Cole offered in 93 to Eriquez) has NOT changed. My question is simple. 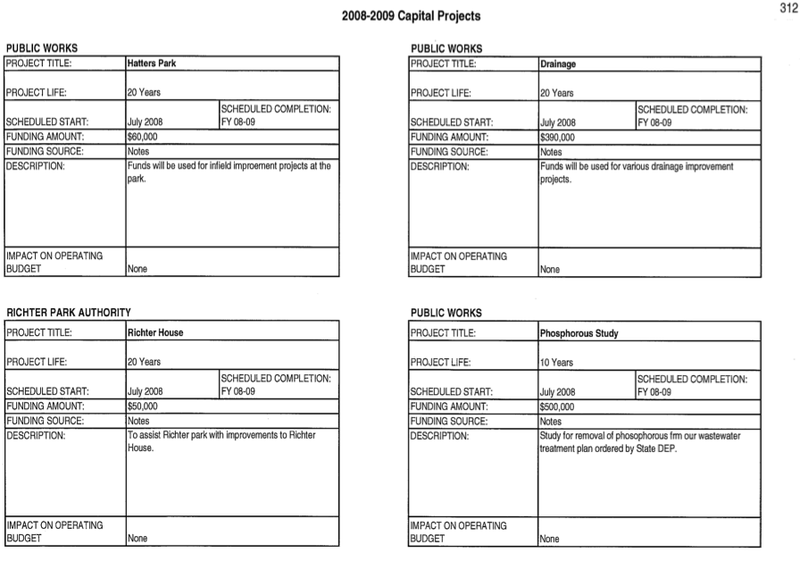 How can a bond council state one thing in '93 (which was BASED on a long standing interpretation of the charter that dated back to prior mayors of decades past) and issue something completely different in near the end of March 2008 days before the presentation of the current budget? Think I'm kidding? Well, listen to former Mayor Gene Eriquez explain to himself. Last week, the former mayor made an appearance on the local access show Ideas at Work and Beyond and answered questions on this VERY subject. (NOTE: Eriquez misspoke when he stated the section of the charter, he meant to say 7-10 and not 17-10). 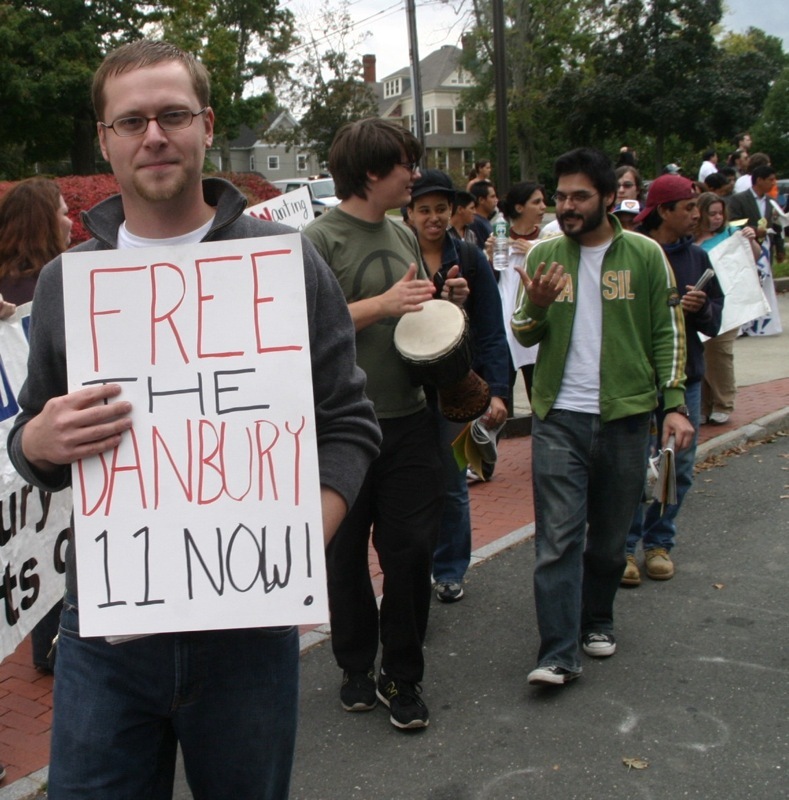 In short, something is wrong here and with drastic increase in property taxes, it seems like the people of Danbury are once again getting the short end of the stick. Again, I'm so sorry that I don't have the time right now to go into further detail right now but this subject is something to consider and keep in the back of your mind when this budget comes up for debate tonight. Well thats interesting. It appears that those questionable bonds are not coming up for a vote tonight. This although there was a public hearing completed on the matter. I've received several emails from readers wanting to know where they can see the full interview where former mayor Gene Eriquez gave his opinions on the budget. You can watch the show in it's entirety over at the Ideas at Work and Beyond website. UPDATE: Post has been updated to correct references to dates. Rev. 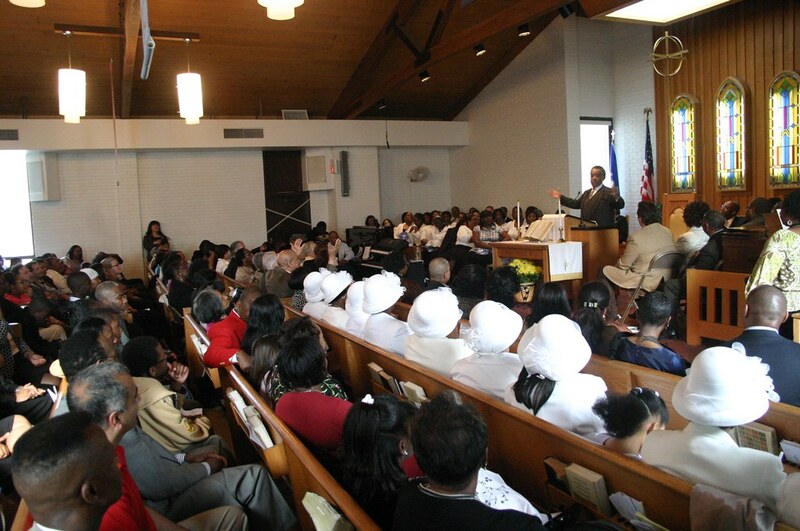 Al Sharpton addresses congregation during the New Hope Baptist Church's 113th anniversary. You've seen the reports, now watch the sermon and decide for yourself whether or not WLAD and The News-Times dropped the ball. UPDATE: Now that you've seen the video, saw the News-Times headline, and heard about the WLAD morning and noon report. Take the poll over over at the right side of this site and decide whether or not the media dropped the ball. What speech did the News-Times hear? "I don't lie to folks and then deport them...I'm coming to a town of switch -- and -- bait." Now, anyone who was in attendance yesterday at New Hope Baptist Church KNOWS that the News-Times' headline is not only misleading, it's flat-out false. Rev. 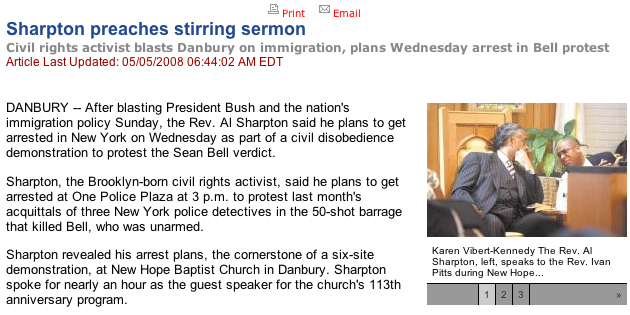 Sharpton didn't go into detail about immigration NOR did he announced to the congregation that he was planning to be arrested in regards to the Sean Bell case in New York (Rev. Ivon Pitts made this announcement AFTER Rev. 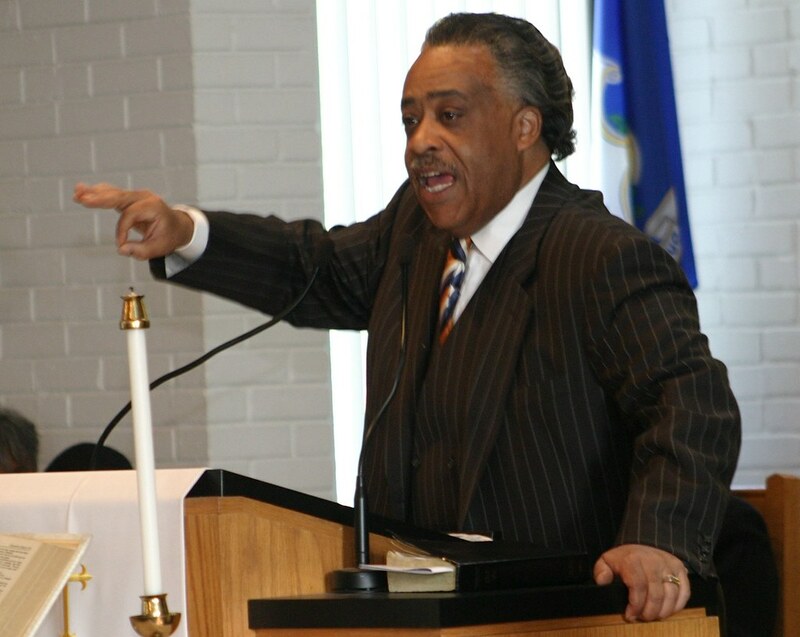 Sharpton's sermon and even stated that Rev. Sharpton had no idea that he (Rev. Pitts) was going to bring this topic up. Why? Because, as Rev. Sharpton stated, he real intention was to come to Danbury and help celebrate New Hope Baptist Church's 113th anniversary. Now to Brian Koonz's credit, he did interview Rev. Sharpton after the sermon but in terms of his speech, I find it amazing that five second remark of a larger 55 minute speech makes it to the headline of the article when the real point of his visit (as he stated) was to celebrate New Hope Baptist Church's 113th anniversary. Now, I was going to spend my day uploading video footage of all the budget ad-hoc committees and point out some VERY ALARMING things about this year's budget (a.k.a we're getting screwed BIGTIME) BUT instead, I'm going to process and upload the video of Rev. Sharpton's ENTIRE speech for you to see with your own eyes. Afterwards, you decide if the News-Times dropped the ball with their headline. UPDATE: Just got word that WLAD's report was even worse than the News-Times headline. In fact, I don't even remember seeing anyone from WLAD at the church (although I could be wrong since the place was so full). I'm getting calls from people who were at the church who are extermely upset over today's headline in the News-Times as well as at WLAD. If you were at the church and are as upset as I am, please leave a comment and help set the story straight. The video is still compressing and should be available for viewing later this afternoon. UPDATE 2: I'm getting numerous complaints from people who have seen some of the most disgusting, racist comments on the News-Times article on Rev. Sharpton. I'm writing this as a warning to those in the media that read this site that your coverage of the sermon is creating a very hostile situation within the area and maybe you should consider making a correction before things get worse. Hats off to the online editor who deleting them but again, this reinforces the notion that the entire comment system on the News-Times should either be removed altogether and the newspaper should revert to the forums format. The News-Times has posted Koonz's video footage from yesterday and in it, you'll see the ONLY thing Sharpton made in regards to immigration during his speech. Now, as I stated earlier, THIS IS THE ONLY REFERENCE TO IMMIGRATION MADE IN SHARPTON'S SERMON. This being the case, how is it that the News-Times ran such a misleading and blatantly false headline which totally misses the point of Rev. Sharpton's appearance? Furthermore, if the reports I heard about WLAD's news report is correct, I will do all I can to make sure that they issue a correction. The media's coverage of this event is shameful to say the least. How the editors at the News-Times and the people at WLAD can spin this Sharpton event from what it was (a celebration of a church) to illegal immigration is probably one of the lowest moments of this year. Once you see my video OF THE ENTIRE SPEECH, you'll see what I mean and understand why I'm so upset (as well as EVERYONE ELSE who was at the service). UPDATE 3: I'm getting a flood of complaints in my inbox about the whole episode. Again, it's better if you direct your rants to the comments section. Publisher: David R. Dear, Jr. When calling, PLEASE BE POLITE. I know there are a lot of people are are very upset right now but just take a deep breath and count to ten before calling. Brian Koonz actually is a great reporter but elements of his story are factually incorrect and if my journalistic background serves me right, he didn't have anything to do with the headline or sub-headline. UPDATE 4: Okay, WLAD updated their 5 PM report to include an interview from Rev. Pitts and made a point to say that 98 percent of Rev. Sharpton's speech had NOTHING TO DO WITH immigration. That's better than the report that pissed everyone off earlier today. I'll post the audio of the updated report later. UPDATE 5: By request, here's WLAD's 5PM report, which is notably different from what was reported this morning. NOTE: In this post, I mentioned that people heard the WLAD report during noon when in fact it was in the morning. I received most of the complaints about WLAD's coverage after 12:00 which led me to believe that the people who emailed me where in act talking about the noon report. My bad.